A quick look at this map reveals stunning patterns. Some cities forbid highways from even approaching their center, while others are surrounded by highways. The map reveals neighborhood-level detail as well as citywide and even regional patterns. We love the addition of live web cams to help tell the story of European cities and their relationship to highways. This map shows you right away the areas in Europe that are within 10 minutes of a highway exit. It makes it easy to understand which cities and even neighborhoods are most accessible by highway. The colors represent increments of 1-, 3-, 5-, and 10 minutes from a highway exit. 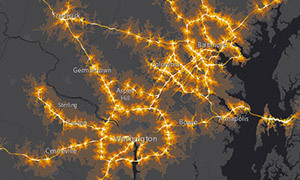 The colors get brighter, much like car headlights, to show that a city is closer to a highway. 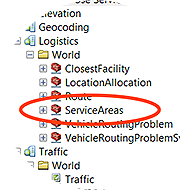 In ArcMap, take a set of points and send them to the ready-to-use tool called "ServiceAreas" in ArcGIS Online. It returns a set of polygons representing the areas that are within 1, 3, 5, and 10-minute drives from that point. Use ModelBuilder to construct a simple model to automate the process, or to send batches of points to the ServiceAreas tool. You only need a set of points representing the highway exits. 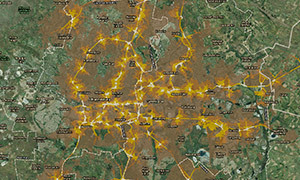 The road network is provided by ready to use services in ArcGIS Online. The highway access areas were calculated using ready-to-use services hosted in ArcGIS which feature a road network from HERE. A simple geoprocessing tool sent 40,000+ exit locations to the service, which returned the 160,000+ service area polygons. This will take about three hours total time. 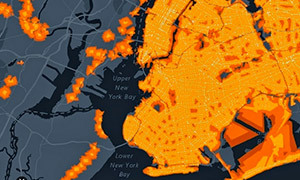 The ready-to-use ServiceAreas tool (see blog) makes this map easy to create. 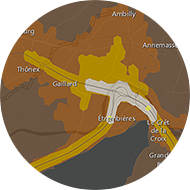 On the Dark Gray Canvas Basemap, the service areas are shown in gradually brighter colors, giving the map an “electric” look. Job Accessible Cities in the U.S.